On Tuesday, the overnight low temperature in Pinehurst was 9 degrees. On Wednesday evening, our nine golf courses, including Pinehurst No. 2, were greeted with six inches of wispy, fluffy snow. Which weather event – the 9 degree temperature or the half-foot of snow – do you think is markedly better for your golf course? While our executives and marketing team may not necessarily want to hear that – to say nothing of golfers who delight in our grand game – a few days under a soft blanket of snow is not just a good thing for a golf course, it’s a great thing. So, what exactly does that mean for our golf courses? It could mean even better conditions for early Spring. And winterkill isn’t evident to a golf course superintendent until temperatures begin to warm and grass begins to grow again. A problem throughout Greensboro and Durham in North Carolina few years ago, winterkill disrupts golf in the spring as clubs can only fix those dead areas when grass can grow again. We’ve endured a rare cold stretch dating back to last week, but the moisture and likely slow melting from the snow Wednesday will continue to protect our fairways and roughs and prove to have a lasting effect. The principle is the same for why the bermudagrass greens are covered when temperatures drop into the low 20s. It’s not the tarps themselves that keep the greens warm and safe from any problems come Spring, it’s the air trapped between the tarp and the ground. The snow does the same thing for the entire course. “There’s plenty of air in snow, and now the ground will stay warmer than the air outside for a few days,” Jeffreys says. There’s also one more golf-related benefit from the snow, which until 4 p.m. Wednesday was only forecast to be about a trace to one inch – our courses are closed for a couple of days. A little nap before Spring. 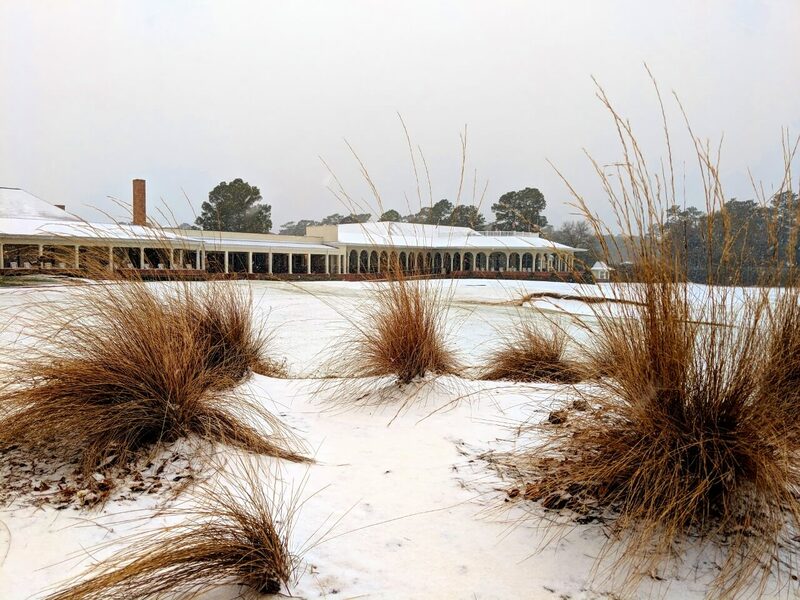 So, revel for a few days in the beauty of our rare snowfall in Pinehurst. And if you’ve already booked your trip for Pinehurst in 2018, you can know that our courses are in good hands.